As you can see, JamandaHalf has had a little summer cleaning and is now rocking a new color scheme. Just in time for the start of another new feature. Hope you enjoy both. Speaking of playlists... Today marks the first step in a long symbiotic relationship between our little blog and Cardboard Smile, the internet home of our good buddy Amitch. Once a week we will be featuring a post from Cardboard Smile and they will do the same for us. With our powers combined, you all will get a taste of Mitch's humor and insights and his readers will get a taste of our ramblings. Both sides win. 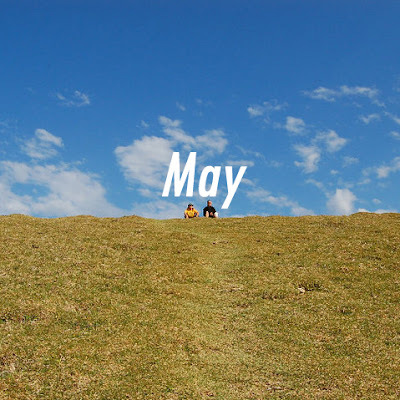 For this week's post I present you all the May playlist, Mitch's once a month selection of the greatest jams of the month. It's the perfect introduction to his great taste of music and I'm sure you'll be bumping these just as much as I have. Happy Summer! I hope this finds you at a pool party. Or sleeping, whatever you do on Sunday nights. I want y'all to know I’m not completely happy with the arrangement of this playlist. Sometimes it’s hard to transition seamlessly from deep moody beats to pop-party summer jams. But these are the songs that made me push replay this month, so I think maybe they will for you too. Cardboard Smile is slowly growing in popularity. Our traffic is up. Nick Bickle joined the team, which is technically just me so we have now become a team. We'll be doing some collaborative projects with Jam and a Half (Big Leks) in the near future. If you have been enjoying these playlists, please, for the love of Jodie Foster in Siesta, LIKE US on Facebook"